If you start your day happy and joyful, there is a greater chance your day will be more productive and you will attract amazing energy. I think how one stars their day and the first things they do in the morning are very important. I have to admit, I wasn’t always a morning person. However once I started to change my habits by making small changes every day my energy, happiness and charisma grew and grew! Waking up early in the morning is a habit that can be very difficult to achieve, but when building a new habit, one has to start with repeated small changes until the new habit is created. Before my early morning habit, my creativity was always more proficient at night time. That’s when I would think up new ideas for my new videos, interviews etc. and mornings were far more difficult where I needed more time to boost my energy and creativity. Realising this and becoming aware of my energy, I embraced the challenge to change this habit. I know it sounds simple in theory, however we become so trapped in our habitual actions that we become unaware of their affects. But how difficult is it to tap into that inner ‘reset’ button? I started by tapping on some more visible buttons, like turning off my electronic devices every night at 9pm and spending the rest of my night reading a book or writing. This change alone had a great affect on me, slowing my energy and helping me fall asleep. Mornings are now my favorite part of the day. Just by waking 2 hours earlier every day, I added an extra 14 productive hours a week. This is a considerable gain that can help you build your empire. Before this change, the first thing I would do in the morning when waking up was check my phone, my messages and of course, my social media. But detaching myself from that automatic habit that created unconscious morning stress, allowed me more mental space to rebuild my own inner power, rather that being a victim of circumstances. I truly believe that what we think about, is what we get and when we control our thoughts, we can create our own world. This is how I started my next morning habit, visualisation. I learnt the power of visualisation from the fantastic Louise L. Hay. I started practising her teachings after reading her book and watching a documentary called ‘You Can Heal Your Life‘. This habit of visualisation has become so strong and engrained that I visualise everything I want in my life for 10-15 minutes each day. I know this may seem like a lot, however when you tap into your subconscious and visualise what you want, it’s like watching a movie in your head of all your dreams coming to fruition… Who wouldn’t want to watch that movie!? What I also believe to be true is what you visualise needs to be for the higher good, with the best intentions. After my morning mental exercises, I dedicate 45 minutes to my breakfast, fuelling my body with the needed ingredients to give the physical and mental energy to run the day. I’ve experimented with many different breakfasts, but I find that a smoothie helps me get hydrated for the day ahead. The smoothie I make is super easy and full of fresh ingredients. I believe one gets far better nutrition from real ingredients than supplements. My smoothie strengthens your immune system, gives you energy, empowers you, helps boost brain function, improves digestion, helps you detox and most importantly it’s delicious!! Good nutrition is the key to good mental and physical health. Here is the secret recipe of my morning smoothie: Sorry to anyone with a nut allergy! After my smoothie I always leave 20 minutes for my meditation. Meditation gives us better focus, less anxiety, more creativity, increases memory and we become more grounded. Meditation is a state of being in your own self. For me, it really helped me to connect with my inner GPS and my intuition. I cannot imagine my life without my habit of meditation. The most important of my daily habits is definitely my workout. It’s always more better for your body and your metabolism to workout in the morning but for all of you that are work in the morning, afternoon is also good as long as your workout gets done! All you need is a solid 30-45 minute workout 3-5 times per week. I like to train 6 times a week but it depends your personal goals. The benefits of working out are endless: reduces stress, increases endorphins, increases oxygen intake, increases oxygenated blood, boosts brain function etc. For me personally, one of my favorite parts of working out is that it gives me the feeling that I did something good for myself, and that I made something of my day, which gives me more power and strength for other tasks and challenges. Remember, it takes 4 weeks for you to see your body changing. It takes 8 weeks for your friends and family and it takes 12 weeks for the rest of the world. So keep going! 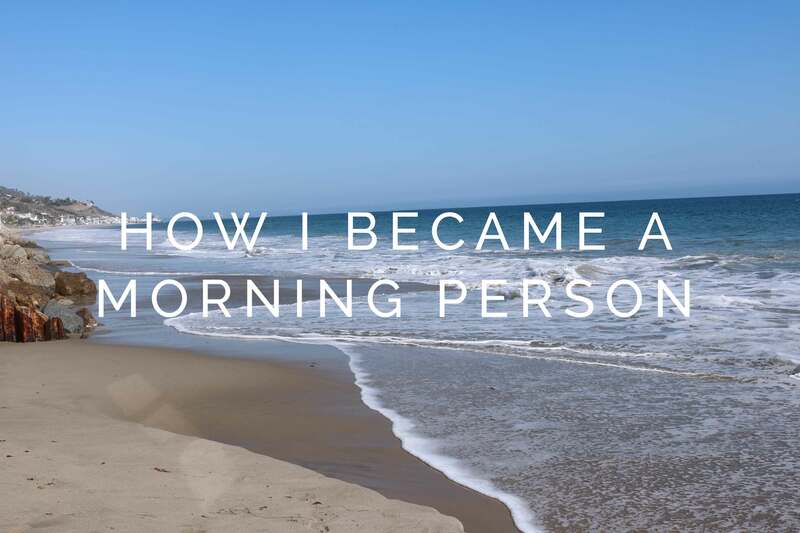 So this is my morning routine, and it usually sets the tone for my day. You decide whether your day is going to be amazing by forming the habits to invest in yourself. Because if you won’t, who will? Newer Post Five Great Steps To Overcome Doubt Older Post How To Drop Your Ego With Five Techniques.